Prototype: 4 German Federal Railroad (DB) freight car types. Type Gs boxcar for less-than-carload-lot service. Type Klm low side car for transporting vehicles. Privately owned tank car for petroleum oil products. Type Kbs stake car for transporting machinery. Model: The 4 car types come in an attractive display, 6 of each car type, with different car numbers. The cars have Relex couplers. Length over the buffers for each car 11.5 cm / 4-1/2". Each car comes individually packaged in its own marked box, 6 boxcars. 00759-01 to 00759-06. 6 low side cars. Automobile models in different colors. 00759-07 to 00759-12. 6 tank cars. 00759-13 to 00759-18. 6 stake cars. 00759-19 to 00759-24. 24 attractive cars from which to choose. All of the models in a Hobby version. Many car numbers for long trains. At your authorized dealer in a display you can see. DC wheel set per car 2 x 700580. Prototype: 2 German Federal Railroad (DB) freight car types. Type Omm 52 high side gondola from the sugar beet harvest. Type X05 low side car for transporting different types of farm vehicles. Model: The 2 car types come in an attractive display, 6 and 18 of each car type respectively, with different car numbers. Each car comes individually packaged in its own marked box, 6 high side gondolas with load inserts. Length over the buffers 11.5 cm / 4-1/2". 00761-01 to 00761-06. 18 low side cars with vehicles. Length over the buffers 10.7 cm / 4-3/16". 6 cars with Deutz tractor models. 00761-07 to 00761-12. 6 cars with Hanomag delivery truck models. 00761-13 to 00761-18. 6 cars with Unimog U 406 models. 00761-19 to 00761-24. Prototype: German Railroad, Inc. (DB AG) general-purpose class 185 locomotive. Version with 2 pantographs. Free advertising theme for the beer brand Schöfferhofer. Model: The locomotive is constructed of metal with many cast-in details. The total design of the locomotive is ideal for model railroad operation. The locomotive has a digital decoder and a special motor. 4 axles powered through cardan shafts. 2 traction tires. The headlights are diodes; they will work in conventional operation and can be controlled digitally. The acceleration and braking delay can be controlled with the 6021 Control Unit or Märklin Systems. The locomotive has adjustable running characteristics. It also has 2 pantographs that can be raised and lowered (they are not wired to take power from catenary). Length over the buffers 21.7 cm / 8-1/2". This locomotive is only available in Germany. "The small black locomotive ..." The high quality design and the original advertising for this tingly Weizen beer are familiar to and recognized by more than just beer connoisseurs. The young woman with the attractive belly button and the French accent is now creating a sensation on our H0 track. With the purchase of this locomotive you will receive a "Schöfferhofer" Weizen beer glass in the size and with the design you would see in a tavern or restaurant (0.5 liters). Model: The locomotive comes with an mfx decoder and controlled high-efficiency propulsion. 3 axles powered. 2 traction tires. The headlights will work in conventional operation and can be controlled digitally. The acceleration and braking delay can be controlled with a 6021 Control Unit or with Märklin Systems. The locomotive has numerous separately applied details. Length over the buffers 16.9 cm / 6-5/8". mfx decoder included for all Märklin modes of operation. 78 to 74. The fast class T 18 tank locomotives from Prussia, Württemberg, and Saarland made up the class 78.0 on the German State Railroad. Over 80% of this roster, or 424 units, came to the German Federal Railroad. They were used primarily in regional service with and starting in 1953 they were ideal motive power for passenger trains with the "new" three-axle rebuild cars, which were authorized for speeds up to 90 km/h / 56 mph. These "partnerships" were maintained in some cases for almost 20 years. After that, the class 78 locomotives were gathered in the Stuttgart District and were retired one by one until 1974. Prototype: German Federal Railroad (DB) class E 52 express locomotive. Model: The locomotive has an mfx digital decoder, controlled high-efficiency propulsion and a sound effects generator. 2 axles powered. 4 traction tires. The headlights will work in conventional operation and can be controlled digitally. The locomotive whistle as well as the acceleration and braking delay can be controlled with the 6021 Control Unit or Märklin Systems. The engine room has interior details. Length over the buffers 19.8 cm / 7-13/16". mfx decoder and electric locomotive whistle. Older style pantographs painted in red. The abundance of water power from the mountains enabled the development and operation of electric locomotives very early on in Bavaria. The highpoint of this development was surely the EP 5, later designated as the E 52. Designed for heavy passenger service on steep grades, these locomotives had four traction motors and a continuous power rating of 1,660 kilowatts or 2,226 hp at a maximum speed of 90 km/h or 56 mph. A total of 35 units of the 140 metric ton EP 5 were built. It was delivered in 1924 in the brown paint scheme of the Bavarian Group Administration but was soon repainted in the gray German State Railroad paint scheme. The DB acquired 29 units and they were initially painted in "bottle" green. Only part of the 22 units that reached Era IV were painted in "chrome oxide" green and all were spared the ocean blue paint scheme. Prototype: Double unit American Locomotive Company (ALCO) class PA-1 heavy diesel locomotive. Diesel electric propulsion. Southern Pacific Railroad "Daylight" paint scheme. Model: This double locomotive has an mfx decoder, 2 controlled high-efficiency propulsion systems, a sound effects generator, and auxiliary functions. Two axles powered in each locomotive, with traction tires. The headlights and the lighted number boards will work in conventional operation and can be controlled digitally. The diesel locomotive operating sounds, horn sound, bell sound, as well as the acceleration and braking delay can be controlled with the 6021 Control Unit or Märklin Systems. The sound of squealing brakes, and the Mars light in the direction of travel can be controlled with Märklin Systems. The locomotive has a powerful speaker. Both locomotives have special electrical and mechanical connections. There are close couplers in standard coupler pockets at both ends; they can be replaced with American couplers or pilot skirting. Minimum radius for operation 360 mm / 14-3/16". Length over the couplers 47.2 cm / 18-9/16". Double locomotive constructed of metal. A heavy unit with impressive pulling power. Two synchronized high-efficiency propulsion systems. Great sound: diesel motor, bell, horn, brakes. Trains in California. The Southern Pacific's Daylight concept first appeared in 1937 with the "Coast Daylight" train between the railroad's home town in San Francisco and Los Angeles. The cars were painted with broad bands in gleaming orange and light red on a dark background; the marvelous "Golden State" class steam locomotives were painted in a similar fashion. Other trains in the Daylight series followed such as the "Sacramento Daylight", the "Noon Daylight" or the overnight train "Sunset Limited". From 1953 on, the GS-2 to GS-5 "Northern" locomotives (4-8-4 wheel arrangement) as the motive power for the Daylight trains were replaced by diesel locomotives. In addition to the EMD E and F type locomotives, the majestic ALCO PA engines were the chief motive power for the trains. Over 60 of this locomotive design were finally delivered for the SP and its subsidiary companies in the Daylight colors. Locomotives for other trains also ran in this design, which was brand identification for the Southern Pacific well into the Sixties. After that, these locomotives were given a simpler but striking red-gray paint scheme. With the reorganization of national passenger service by Amtrak, several Daylight trains were still run after 1971, but only in the silver standard design and, most importantly, without the famous ALCO PA locomotives. Amtrak did not take these great machines into its motive power roster of passenger locomotives. The Southern Pacific used part of the PA series in freight service and traded part in towards new locomotives. Prototype: German State Railroad (DRG) class 86 standard design locomotive. Used for passenger trains. Model: The locomotive comes with an mfx decoder, controlled high-efficiency propulsion, and Telex couplers for remote uncoupling of cars at any spot on the layout. 4 axles powered. 2 traction tires. The headlights change over with the direction of travel, will work in conventional operation and can be controlled digitally. The Telex couplers front and rear as well as the acceleration and braking delay can be controlled with a 6021 Control Unit or with Märklin Systems. The locomotive has separately applied grab irons. Length over the buffers 15.8 cm / 6-1/4". Remote-controlled Telex couplers front and rear that can be controlled separately. German State Railroad version with dual headlights. One-time series for the Märklin "Exclusiv" program. Daun on the Lieser. One of the photographs from the archive of Carl Bellingrodt shows the tank locomotive with the road number 86 004 with passenger train P 3320 in 1937. The impressive scene plays out on the viaduct across the small Lieser River before the station at Daun in the Eifel region. The well-proportioned standard design locomotive pulls the versatile passenger cars of the unmistakable Langenschwalbach design. In addition to the marvelous presentation of large locomotives in dynamic poses, the inexhaustible life's work of this master also shows many images from scenes of quite ordinary railroad life. Each of these images is also an individual masterpiece by virtue of the composition of the subject and the quality of the execution. The models making up the Daun train will satisfy the exacting demands of everyone: authentic paint and lettering, powerful motor and gear drive, and current digital technology. The Telex couplers enable you to move the locomotive around the train between the entry and departure from the station – just like the documented prototype. The Langenschwalbach cars to make up passenger train P 3320 are available as a car set under item no. 43047. Prototype: German State Railroad (DRG) Langenschwalbach design branch line cars, 3rd production run starting in 1907. One each type C4itr Pr 14 coach, 3rd class with a baggage area, type C4i Pr 15, 3rd class, type BC4i Pr 14, 2nd and 3rd class, as well as a type PwPost4i Pr 14 baggage car. Model: The passenger cars have open, closed or mixed vestibules. The mail-baggage car has closed vestibules. The trucks are specific to these cars. The cars have separately applied grab irons and walkover plates. The cars have a representation of gas lighting. They also have older design open buffers. Total length over the buffers 60.8 cm / 23-15/16". German State Railroad paint scheme of the Thirties. Representation of gas lighting with containers and vents. DC wheel set 16 x 700580. Interior lighting for the set: 4 x 73400, 4 x 73405. The 43046 car set together with the 37860 locomotive makes up the authentic model of the passenger train P 3320 from 1937. Prototype: Type BC3yge, 2nd/3rd class, and type C3yge, 3rd class, rebuild cars. Permanently coupled double cars. Version from the class reform of 1955. Model: The cars have plug-in couplers in NEM coupler pockets between the car halves. Length over the buffers 30.5 cm / 12". Version from 1953/54: 3rd class seating and a "bottle green" paint scheme. Rebuild Program. At the start of the Fifties, the new DB had more than 20,000 passenger cars from the former provincial railroads, and these cars were of limited use only due to wear and tear or war damage. The rebuilding of German under the Federal Republic demanded cars for commuter service, but the finances were lacking for such an extensive effort, and designs were not ready for new commuter cars. The solution was an extensive rebuilding program, which was used starting in 1953 to produce standard design, modern, reasonably priced cars from the different provincial railroad car types. The three-axle frames were standardized and had new, flat wall bodies built on them with three different interiors: 3rd class, 2nd and 3rd class, as well as 3rd class with a baggage area. The cars were always assembled in pairs and wired symmetrically. In this way, they corresponded to the length of the new cars being built with a length of 26.4 meters / 86 feet 7-3/8 inches. Six thousand five hundred individual cars were built in 5 years, and they made up passenger trains and fast passenger trains ("Eilzüge") in all of West Germany until the beginning of the Eighties. DC wheel set 4 x 700580, 2 x 406240. The models under item numbers 43172, 43182 and 43192 represent the typical rebuild car combinations. The 37074 fast tank locomotive is an ideal choice for an early Era III passenger train with these cars. Prototype: Two each type C3yge, 3rd class, rebuild cars. Permanently coupled double cars. Version from the class reform of 1955. Prototype: Privately owned car lettered for the firm Pernod Ricard for Ramazzotti herbal liqueur. Model: The car has a four-axle freight car frame with trucks and a brakeman's cab. The car is finely modeled with a partially car floor, metal side sills, and close couplers. The tank is made of real glass and can be filled with liquids and sealed with a cork. The car has special mounting bands made of metal. Length over the buffers 14.3 cm / 5-5/8". One-time series for the Märklin "Exclusiv" program. This car is not available in Switzerland. Ramazzotti. In 1815, Ausano Ramazzotti produced the semi-bitter herbal liqueur with his name in Milan for the first time. This "Amaro" from a recipe still secret today was one of the most successful bitters at that time. Ramazzotti is a favorite drink in a small, heavy glass, on ice and with a lemon wedge. This brand has belonged to the French group Pernod Ricard since 1985. Prototype: Type Tadgs for transporting grain, used on the German Federal Railroad (DB). Privately owned car painted and lettered for the Herforder Brewery, Felsenkeller, Germany. Model: The cars have a metal insert for a low center of gravity and for quiet running. They have many separately applied details. The cars have different car numbers and come individually packaged. Total length over the buffers 51.5 cm / 20-1/4". DC wheel set 12 x 700580. Prototype: Standard design tank cars, used on the German Federal Railroad (DB). Older design with stamped sheet metal trucks and a brakeman's cab or a brakeman's platform. 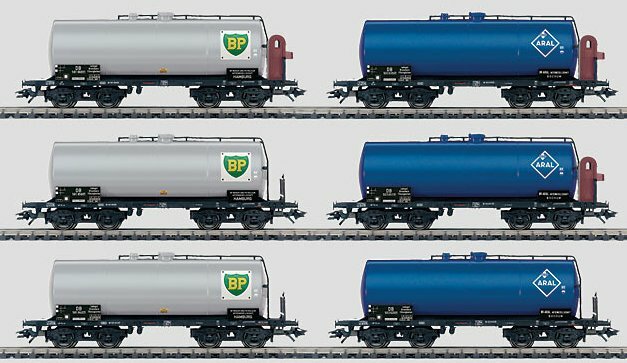 Privately owned cars painted and lettered for the oil companies BP and ARAL. Model: The cars have special quiet running trucks. The cars have separately applied ladders and catwalks. Length over the buffers 14.2 cm / 5-9/16". All of the cars have different car numbers and come individually packaged and marked. BP, silver: 46527-1 to 46527-3. ARAL, blue: 46527-4 to 46527-6. DC wheel set per car 4 x 32376004. Prototype: Heavy oil car based on a German Federal Railroad (DB) maintenance tank car. Model: The car is painted and lettered in the Märklin Magazin design. The car has a separately applied brakeman’s platform and a ladder at one end. The car also has separately applied steps and depressions for steps in the tank cladding. Length over the buffers 13.1 cm / 5-3/16". Operating close coupler with single-pole electrical connection for lighted passenger cars. This coupler can be used for cars with the lengths 26.4 cm / 10-3/8", 27.0 cm / 10-5/8", and 28.2 cm / 11-1/8" that are ready for lighting kits. These couplers can be used when you are installing the 73400 lighting kit. One car in the consist requires a 73404, 73406, or 73406 pickup shoe. Contents: 2 close couplers for standard coupler pockets with contacts, 2 sets of contacts for the coupler shafts, 1 ground spring for the truck, 2 wires for connections, and instructions are included. You have reliable connections with snap-in contacts. You can couple and uncouple a car with this coupler manually on a layout; these couplers will also couple with regular close couplers without electrical contacts. Model: The car is painted and lettered in the Märklin Magazin design. The car has a separately applied brakeman’s platform and a ladder at one end. Length over the buffers 61 mm / 2-3/8". Prototype: Different German State Railroad Company (DRG) freight cars. Type H10 "Regensburg" pair of load cradle flat cars for transporting logs. Type K15 "Wuppertal" gondola with hinged roof hatches. "Berlin" design oil tank car as a privately owned car. Model: The load cradle flat cars have a load of real wood the full length of these cars. Total length over the buffers 55.0 cm / 21-5/8". The gondola with hinged roof hatches has hatches that can be opened and closed. Length over the buffers 20.5 cm / 8-1/16". The tank car has an authentic paint scheme and lettering for the firm OLEX. Length over the buffers 27.5 cm / 10-13/16". Minimum track radius for operation 600 mm / 23-5/8". Old-timer cars for Era II freight trains. Can be used on small layouts too. Each model comes individually packaged. These German State Railroad cars go well in a freight train with the new Insider model of the class 96 tank locomotive (item no. 55961). Prototype: German Federal Railroad (DB) class E 52 express locomotive. 2-B-B-2 wheel arrangement, built starting in 1924. Used for heavy passenger trains. Version from Era III. The locomotive has a die-cast metal frame. It has a digital connector. 2 axles powered. 2 traction tires. The triple headlights front and rear change with the direction of travel. They will work in conventional operation and can be controlled digitally, when the locomotive is retrofitted with a decoder. The locomotive has NEM coupler pockets. Length over the buffers 198 mm / 7-13/16". The abundance of water power from the mountains enabled the development and operation of electric locomotives very early on in Bavaria. The highpoint of this development was without a doubt the EP 5, later designated as the E 52. Designed for heavy passenger service on steep grades, these locomotives had four traction motors and a continuous power rating of 1,660 kilowatts or 2,226 hp at a maximum speed of 90 km/h or 56 mph. A total of 35 units of the 140 metric ton EP 5 were built. They were delivered in 1924 in the brown paint scheme of the Bavarian Group Administration but were soon repainted in the gray German State Railroad paint scheme. The DB acquired 29 units and they were initially painted in "bottle" green. Only part of the 22 units that reached Era IV were painted in "chrome oxide" green and all were spared the ocean blue paint scheme. Prototype: Ruhrkohle AG (RAG) (Ruhr Coal, Inc.) diesel locomotive, road no. 821, and two type Fals hopper cars. Use: Freight service and switching work. Era V.
Model: The locomotive has a digital connector. The body is made of plastic, and there are separately metal side and end handrails. The white headlights / red marker lights change over with the direction of travel. 4 axles powered. 2 traction tires. The locomotive and cars have close coupler mechanisms. Total train length 238 mm / 9-3/8". An oval of track 52 x 42 cm / 21" x 17" and a battery-powered locomotive controller are included. The set can be expanded with the entire Minitrix track program. Prototype: German Federal Railroad (DB) class 280 diesel locomotive and 3 stainless steel commuter cars ("Silberlinge / Silver Coins"): type ABnrb, 1st and 2nd class, type Bnrb, 2nd class, and type BDnf cab control car, 2nd class. Era IV version of the locomotive and cars. Model: The locomotive has a digital connector. 4 axles powered. 2 traction tires. The headlights and marker lights are LED's. The locomotive and cars have close coupler mechanisms. The white headlights / red marker lights on the cab control car change over automatically with the direction of travel. Total train length 580 mm / 22-13/16". Prototype: Swiss Federal Railways (SBB/CFF/FFS) class Ce 6/8 III. Built starting in 1926. Articulated locomotive known as the "Crocodile". Use: Heavy freight trains, more rarely for passenger trains on the Gotthard line. Original version from Era II. Model: The locomotive is a conventional version for DC operation. The locomotive has a powerful can motor with a bell-shaped armature. 6 axles powered. 2 traction tires. The headlights change over with the direction of travel. Length over the buffers 125 mm / 4-15/16”. One-time series for the anniversary "125 Years of the Gotthard Line ". An especially heavy, powerful locomotive able to master steep grades on lines with many curves was needed for freight service on the Gotthard route. Locomotives were developed as the classes Be 6/8 III und Ce 6/8 III and entered railroad history with the nickname “Crocodile” due to their striking appearance. The striking articulated construction of these locomotives finally fulfilled the requirement for trouble-free freight transport over the Gotthard Pass. Since new improvements were always applied to these locomotives, there are a large number of variations, which are unmistakable as a “Crocodile”, whether in a green or brown paint scheme, and which hold a special fascination for everyone. The digital version of the "Crocodile" with a different road number is available as item no. T12153. Prototype: German Federal Railroad (DB) standard design locomotive class 01 steam locomotive, 4-6-2 wheel arrangement, built starting in 1925 for the German State Railroad Company. Version with older design boiler and Witte smoke deflectors in Era III. Model: The locomotive comes with a die-cast metal locomotive frame and tender frame and a die-cast metal tender body. The locomotive has a digital connector and a built-in decoder for operation with Selectrix, DCC, or DC power; the decoder has automatic system recognition. The motor and gear drive are in the tender and the motor has a flywheel. 4 axles powered. 4 traction tires. The headlights change over with the direction of travel, will work in conventional operation, and can be controlled digitally. The smoke box door can be opened. There is a close coupling between the locomotive and tender. The tender has an NEM coupler pocket on the rear end. Length over the buffers 150 mm / 5-7/8”. Express locomotives were always the stars among steam locomotives by virtue of their power, elegance, and speed. The class 01 heavy express locomotive was probably for all intents and purposes the personification of the German standard design locomotive. It was reliable motive power for impressive express trains as well as for mundane passenger trains. By 1938, a total of 231 class 01 locomotives had been produced by different German builders. In addition, there were also 10 class 02 locomotives rebuilt between 1937 and 1942 to the class 01. After World War II, 165 of the class 01 locomotives remained in the western occupation zone and 70 in the Soviet zone, of which several had to be retired due to extensive damage. Starting in the Fifties, both German railroads rebuilt their locomotives several times and adapted them to new uses by making use of technical progress. In West Germany, the large Wagner smoke deflectors were replaced by the small Witte versions, the compressor and feed water pump wandered on the DB locomotives from the niche on the smoke box to the center of the boiler, and the front skirting between the buffer beam and the running boards was removed on numerous units. The class 01 was taken out of service on the DB in the middle of the Seventies; on the DR they lasted until the Eighties. Retrofit kit for brakeman’s steps, rail guards, and a front coupler with a pocket included. Prototype: German Federal Railroad (DB) class V 60 switch engine. C wheel arrangement, built starting in 1956. Used in switching work. Original version from Era III. Model: The locomotive has a digital connector. The motor has a flywheel. 3 axles powered. Length over the buffers 67 mm / 2-5/8". Class sequence: V60, 260, 261, 360, 361, 362, 363, 364, 365. Starting in 1956, the DB's standard switch engine was introduced under the descriptive class designation V 60. This meant: combustion powered locomotive with approximately 600 hp – it was actually 650 hp. Starting in 1968, these locomotives were given computer numbers: class 260 for the standard version with a service weight of 49 metric tons, class 261 for the heavier version with a weight of 53 metric tons. In 1987, these units were all "degraded" to small locomotives in order to save personnel costs for locomotive engineers. The class numbers from then on were 360 and 361. At the same time, these switch engines were retrofitted with radio remote control. They could now be operated unmanned from the ground and were given the new class numbers 364 and 365. Starting in 1997, these remote controlled locomotives were updated with new motors – they are now called the class 362 and 363. Of a total of almost 1,000 V 60 locomotives built, around 400 units are still in use today – after almost 50 years an unparalleled success. Prototype: German Federal Railroad (DB) class 260 switch engine. C wheel arrangement, built starting in 1956. Used in switching work. Version from Era IV with computer numbering. Prototype: German Federal Railroad (DB) class 361 switch engine. C wheel arrangement, built starting in 1956. Used in switching work. Version from Era IV as a small locomotive in the ocean blue paint scheme. Prototype: German Federal Railroad (DB) class 362 switch engine. C wheel arrangement, built starting in 1956. Used in switching work. Current version from Era V in the traffic red paint scheme.